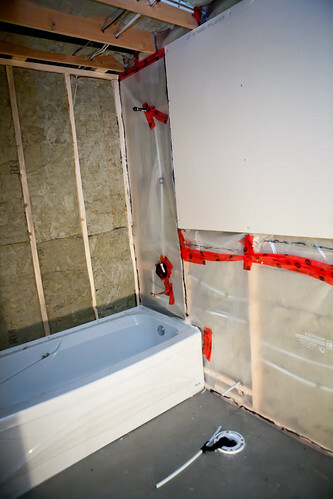 After one week, we have finished the framing, plumbing, electrical and insulating. Gary and I insulated Fri, Sat and Sun evening. Phew, done!! Not a difficult job but a kind of itchy one. 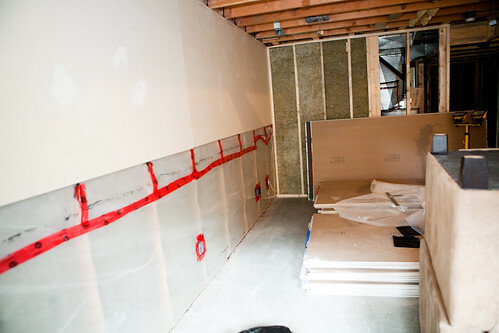 We had to do a lot of tuck taping (the red tape) because the vapour sheet was half done when we moved in so we had to seal it all off. Tomorrow night is our drywalling `party' and I am SO nervous for some reason. Gary and I will do a bit tonight but save all the ceilings for tomorrow (ceilings are supposed to be first but the walls were partially done when we moved in). I just want the guys to do a really good job on it and I think I will be such a stress case if I'm around...I'm thinking of just leaving and letting them do their thing. We'll see! Our mudder is going to have to work over a 2 week span (due to holidays) which puts us back onto the original schedule, even though currently we are one week ahead. I have to say that I am learning a ton and it`s interesting. Just time consuming. I had to get a picture with these shoes. I have to throw them away but they are special to me. 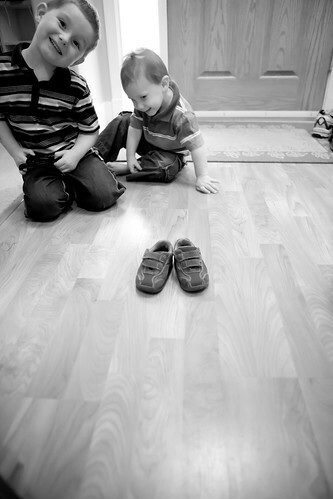 They are Kai and Koen`s first walking/running shoes. Good old brown Dr. Scholl's shoes. I bought them secondhand for $5.00, 4 years ago, they have done well! 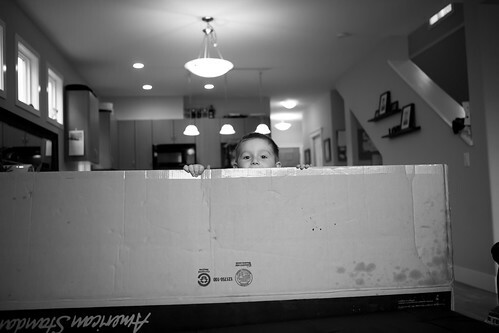 This box remains in our living room and has provided oodles of entertainment for the boys. In photography news, we are pretty much booked up until September 2011 next year as I am cutting down my bookings to half. We got asked about 3 weddings (for next year) on Saturday alone...I am getting so much better at saying no. As much as I want to take everyone's picture, I can't. There is no way I could repeat this years work again. I want to have a lot more family time. This year we have 20 weddings and next year we already have 10-12. We will see. Interesting balance though, life and work, with kids and a husband in there. 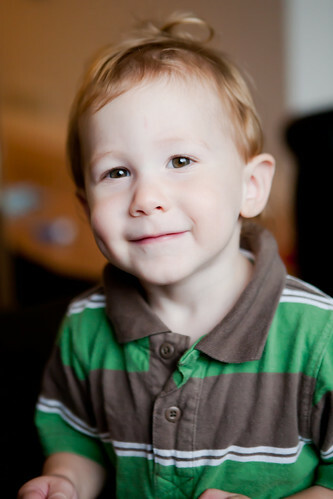 i LOVE that picture of Koen - SO cute!